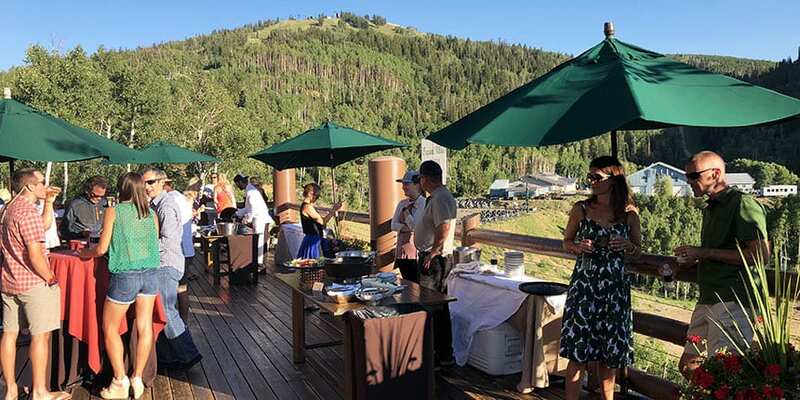 Hops on the Hill pairs craft beer with delectable food and spectacular mountain views. 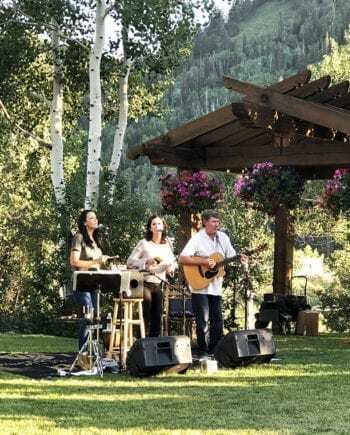 The weekly menu also features live music, casual conversation, and a break from the Salt Lake valley heat. Hops on the Hill takes place each Tuesday from July 17 to Aug. 28, 2018. Chef Zane Holmquist chats with Hops on the Hill visitors. He’s pairing his peach-glazed pork sliders with RoHa Brewing Project’s Three Deep American Ale. 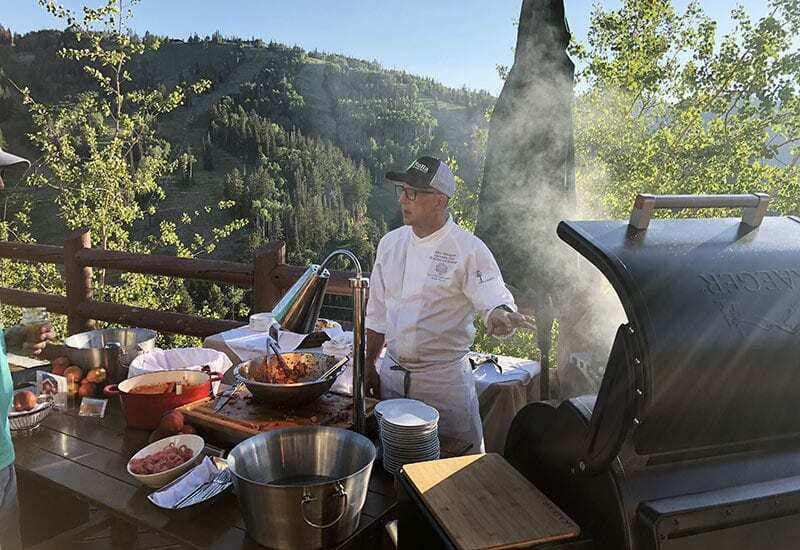 Now in its sixth year, Hops on the Hill aims to show the “casual side” of Deer Valley’s five-star Stein Eriksen Lodge, says Zane Holmquist, the property’s corporate chef and vice president of food and beverage. Each Tuesday during the seven-week series (July 17-Aug. 28), a unique $20 food and $20 beer pairing is offered. 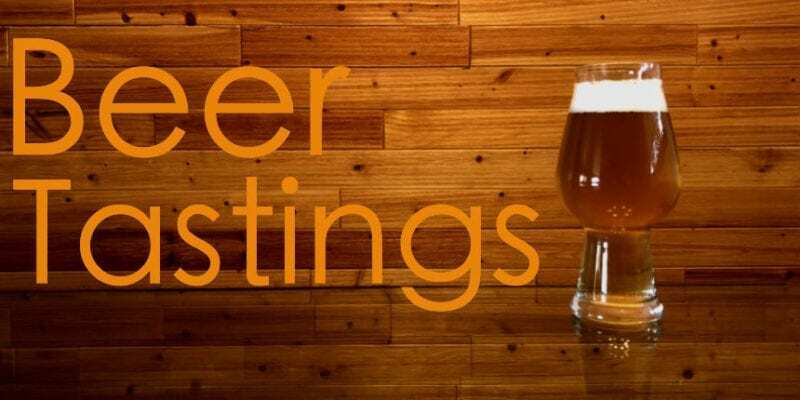 Two craft breweries are invited each week and they typically each bring up to four beers for sampling. Once Chef Zane receives the week’s beer list, he and his team go to work choosing local foods to pair with the beer selections. Even more, a portion of proceeds benefit the local Youth Sports Alliance, according to the event website. Free live music accompanies the food and beer pairings at Stein Eriksen Lodge’s Hops on the Hill. 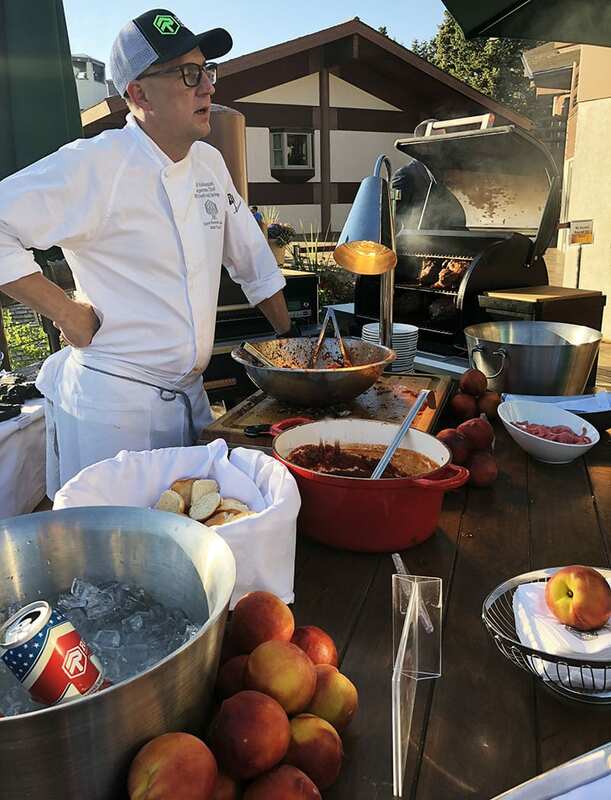 Chef Zane isn’t a stranger to Utah’s beer scene. He worked at Squatters in its infancy in the early 1990s and helped to open the Fuggles property. He’s spent 18 years at Stein Eriksen and characterizes its beer list as one of the best in Park City. 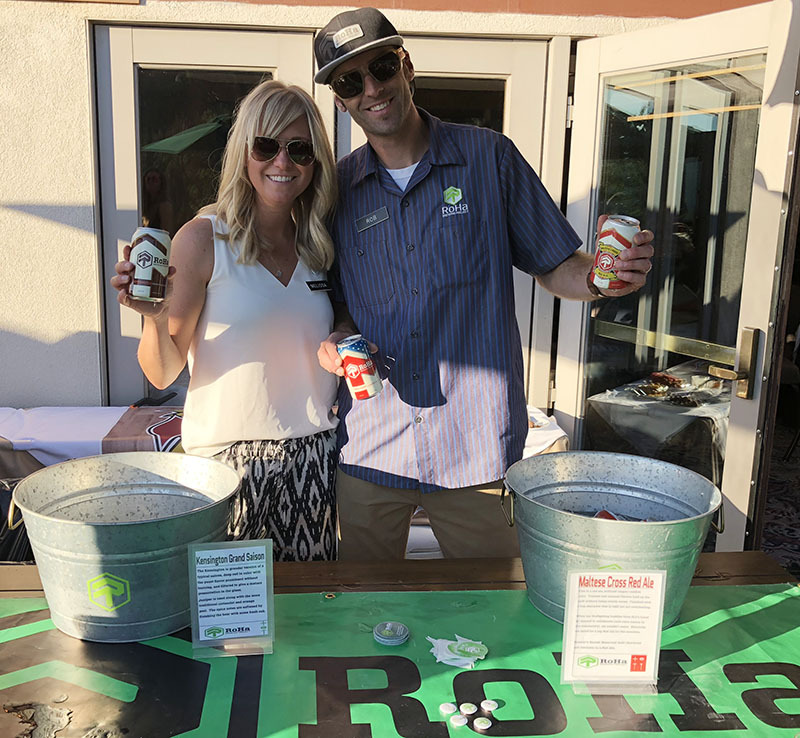 Hops on the Hill participating breweries this season include: RoHa Brewing Project, Squatters Craft Beers, Park City Brewery, Shades Brewing, Epic Brewing, Bohemian Brewery, 2 Row Brewing, Red Rock Brewing, Proper Brewing Co., Wasatch Brewery, Bonneville Brewery, and Mountain West Hard Cider. 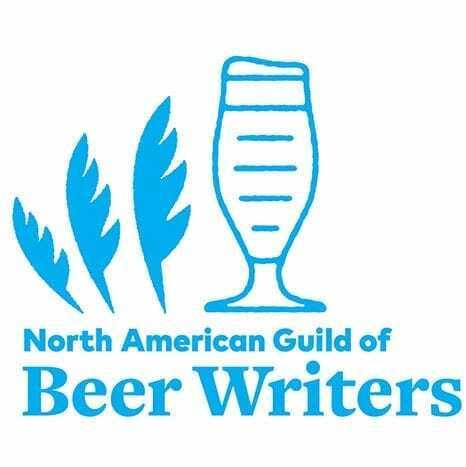 This year Chef Zane’s invited two out-of-state breweries to be part of Hops on the Hill. 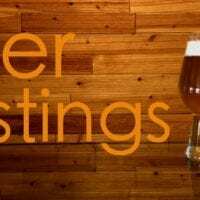 Wyoming’s Melvin Brewing is slated to pour Aug. 7 and Napa Valley’s Mad Fritz Beer will help close out the series on Aug. 28. 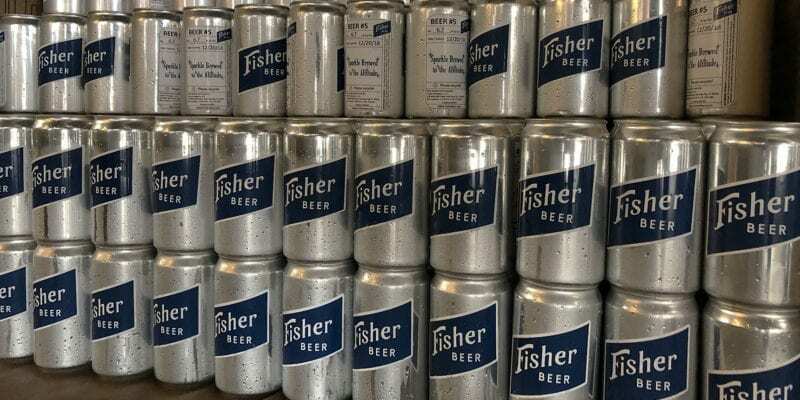 Mad Fritz, Chef Zane says, is the exclusive brewery for famed The French Laundry. The Mister Sister Trio entertained at Hops on the Hill on opening night. 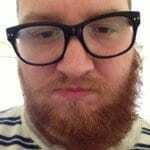 A different band is booked each Tuesday. Live music is also an important component of Hops on the Hill. On a nearby lawn you can listen to a different band each week. You’re welcome to bring a blanket and enjoy a free concert (food and beverage available for purchase à la carte). On opening night, Mister Sister Trio harmonized flawlessly and serenaded the crowd with its lively blend of classic and contemporary tunes. Rob Phillips and his wife Melissa pour RoHa Brewing Project beer at Hops on the Hill. Rob is the “Ro” in RoHa. The season-opener featured RoHa Brewing Project, one of Utah’s newest craft breweries, and Squatters Craft Beers, one of the state’s oldest. 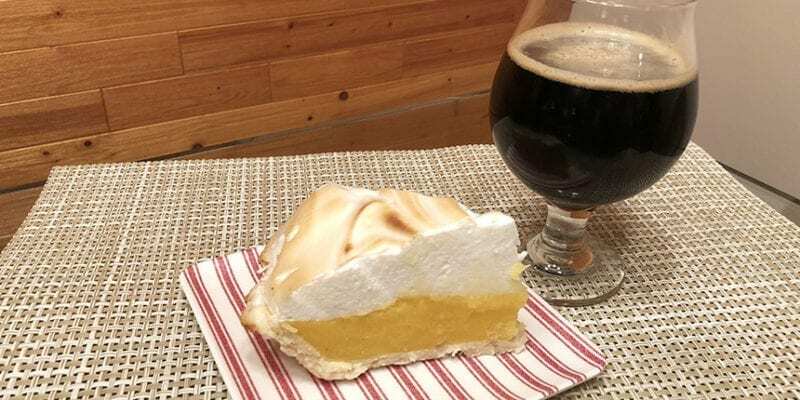 At Hops on the Hill, RoHa poured its Maltese Cross Red Ale, a collaboration with Salt Lake Firefighters Local 81, as well as its Three Deep American Ale, and its award-winning Kensington Grand Saison. Squatters Craft Beers’ Erika Palmer, left, and Amy Tangaro pour Chasing Tail Orange, among others, at Hops on the Hill. At the next table over, Squatters poured its Chasing Tail Orange, a twist on its popular Chasing Tail Golden Ale. 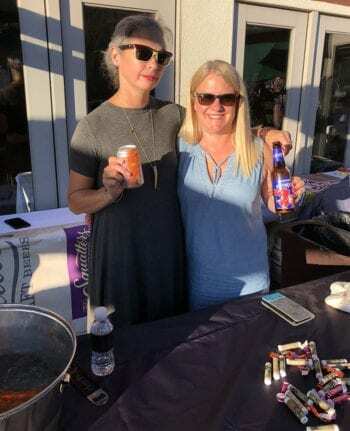 A portion of proceeds from Chasing Tail Orange benefits Best Friends Animal Society, says Squatters marketing manager Amy Tangaro, whose adopted pitbull-boxer is the can’s cover dog. Across the way, Squatters’ newer Tropical Hop Rising Double IPA, in which the tropical notes are derived from hops, flowed. 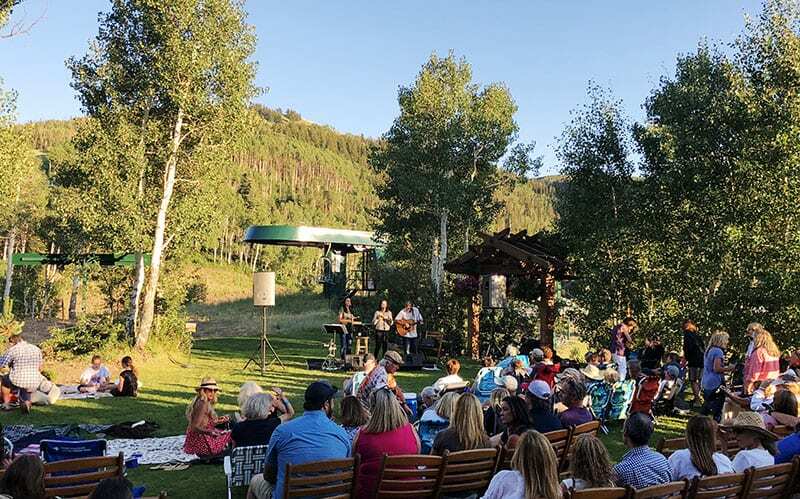 The Stein Eriksen Lodge, which is currently undergoing a $14 million expansion, provides a picture-perfect backdrop for enjoying a pleasant summer evening of beer, bites, and tunes. Hops on the Hill 2018 features $20 food and $20 beer tastings on the deck (reservations recommended). BONUS: Bring a blanket and find a seat on the nearby lawn to enjoy free live music. Each week features a different band. 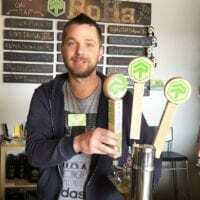 This entry was posted in Blog, Out & About and tagged Hops on the Hill, RoHa Brewing Project, Squatters Craft Beers. Bookmark the permalink.